← Committees of Correspondence = 18th Century Social Media? Today, we are pleased to welcome guest authors Drew and Kate Gruber. 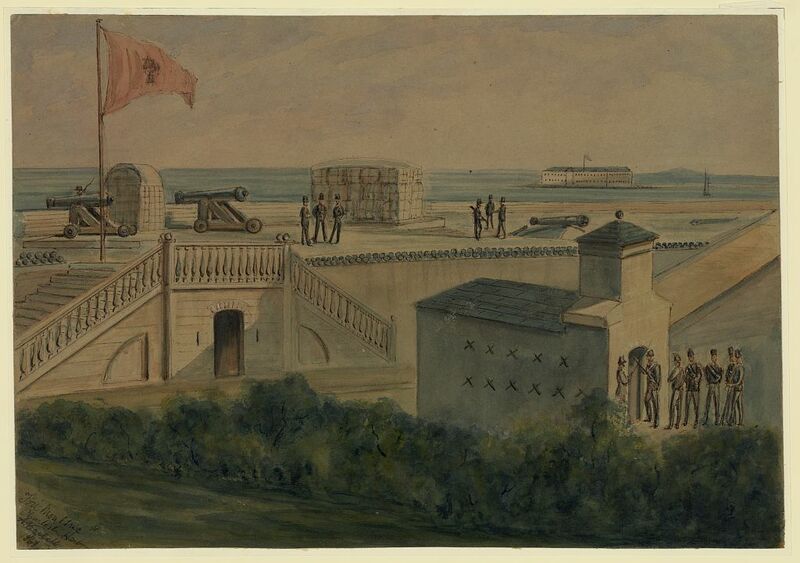 Fort Moultrie, Charleston Harbor by A. Vizitelly c.1861. Courtesy of the Library of Congress. “There appears to be a romantic desire urging the South Carolinians to have possession of this work, which was so nobly defended by their ancestors in 1776…” wrote Major Robert Anderson from Fort Moultrie on November 28, 1860, less than five months before the first shots of the American Civil War. Many historians of American history have looked upon the Civil War as a continuation of the American Revolution. Looking back today, the similarities are not hard to see. According to historian Peter S. Carmichael, confederates “proclaimed their nation to be the keeper of America’s revolutionary heritage.” Similarly, James McPherson notes that “Union volunteers invoked the legacy of the Founding Fathers…if disunion destroyed this nation, the generation of 1861 would prove unworthy of the heritage of republican liberty.” This idea was not lost on Civil War soldiers, and their own connection to the ideals of the American Revolution grew even stronger when their marches and battles brought them close to, and even directly on, the landscapes and landmarks sacred to the memory of the American Revolution—soldiers were quick to identify the cause of the Revolution as their own. As soldiers converged on Mount Vernon, Williamsburg, and Yorktown, the connections they made to the revolutionary past of these locations strengthened their own resolve. Valerius Cincinnatus Giles upon enlistment in the 4th Texas Infantry. The 4th Texas Company B soldier Valerius Cincinnatus Giles could not help but make the connection between the American Revolution and the war in which he was now engaged as he marched through Williamsburg, Virginia in 1862. Walking through the streets of the old colonial capital, Giles remembered, “We sallied forth to inspect William and Mary college where two presidents and Patrick Henry got their inspiration for American independence, the very thing that we were struggling for.” Though Patrick Henry delivered his immortal “Give me liberty, or give me death” speech sixty miles west in Richmond, it was easy for Giles to conflate his memory of revolutionary history at Williamsburg which served as the capitol of Virginia until 1780, and saw the muster of the First Virginia Regiment under Patrick Henry in 1775, along with the occupation of the British army in 1781. Tipton Davis Jennings as he appeared after the war in the Confederate Veteran. Though much changed in the United States between Washington’s victory against Cornwallis in 1781 and the first shots of the Civil War in 1861, the rhetoric, emotion, and memory of the American Revolution remained steadfast. 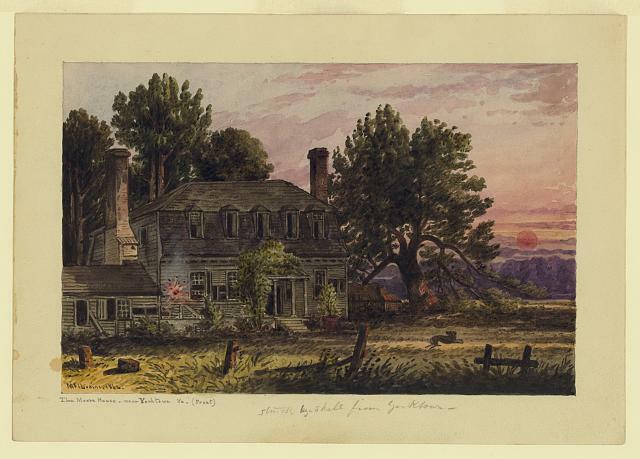 Soldiers on both sides of the War Between the States found solidarity and purpose in their cause on the landscapes they shared with the American Revolution. Kate Egner Gruber holds her B.A. in Historic Preservation from the University of Mary Washington and a M.A. in American History from the College of William and Mary. She is curator for the Jamestown-Yorktown Foundation in Williamsburg, Virginia. Peter S. Carmichael, The Last Generation (Chapel Hill: UNC Press, 2005), 181. James McPherson, For Cause and Comrades (New York: Oxford University Press, 1997) 18-19. Val C. Giles, Rags and Hope. Edited by Mary Lasswell (New York: Coward-McCann, 1961) 93. Official Records of the Union and Confederate Armies. Series 1, Volume 11, Chapter 23- ‘The Peninsular, Campaign, Virginia Mar 17-Sep 2, 1862.’ Part 1. 606. “General Magruder’s Address,” The Daily Dispatch (Richmond), March 10, 1862, pg 1. This entry was posted in Armies, Battlefields & Historic Places, Battles, Campaigns, Revolutionary War. Bookmark the permalink.